One year ago today, I woke up like any other day and I headed off to work, little did I know that it would end up being a defining day of my life. Some of those so called defining moments are the worst ones to bear, even when everyone tells me it will all work out for the best. You all might be right, I still don't see it that way yet but I also don't see it the way I did that day. That day I had to leave work early because my emotions were all over the place, when a client called in, I ended up bursting into tears... I quickly messaged someone that I had to leave, I looked for my quickest exit and I barely made it to the door before I was sobbing beyond control. I walked a fair distance to catch the bus so that I could get my emotions under check. Still I sobbed on the bus, then at home... that was the night I stopped sleeping for nine long months. However; saying all this, I have moved on from that day, I finally started to sleep about three months ago, which was a blessing... I have NO idea how I functioned on so little sleep? I never want to do that again. Also, I don't cry most of the day anymore, which is so much better. I couldn't see a light at the end of the tunnel but I held on when I couldn't see it because I KNEW it was there. I think we all have defining moments in our lives that could totally tear our foundation apart and that day was one of those days for me... Somehow, I held it together and I came through. If you had asked me a year ago where I thought I would be emotionally, I never thought I would have come as far as I did. Yes, I still have a way to go but at least I am on the right path now... for nine months I wasn't anywhere, I was in limbo... and that is not a place to live. If I could change that day, would I? I would if I could but of course I can't... instead I have to keep living with the fallout ... just keep moving forward. Even when I don't see the whole picture yet, the light is enough to keep me there until I can see the full picture. I'm happy you feel better now. Totally agree Launna! I love your quotes and your posts a re always full of inspiration!!! Oh Launna I have no idea how you've managed. Especially with no sleep for all that time. They say things happen for a reason and I suppose in time you'll understand what the universe needed you to know and put you in that position when it tore down your foundations. I think what you can take from this is your incredible strength. And though you might not see it that way here you are today seeing some kind of light in this terrible tunnel. Even though it's not in your sight just yet you've found hope of something and that is big in itself. You are an incredible person, never forget that. It has been quite the journey, you came from far, Launna. I can't remember where I heard it, but someone said when you look back at your life, you'll see a handful of days that define everything. Those are the major milestones in life. All else is just daily life! There is a saying about waiting for the storm to pass that says you should instead learn to dance in the rain. I think that's a pretty good way to look at it! Life's too short anyway...we should try to find happiness in the now, any way we can. Nobody else can take that happiness away from you if you choose to live for YOU. This part stood out to me: "I still don't see it that way yet but I also don't see it the way I did that day" - we incrementally begin to see how monumental certain moments are, even if we can't imagine that at the time. It is so great to hear all of the progress you have made in one year!! I get a sense of you moving on so much through your writing. You have so many people pulling for you to be back to 100% and fully happy. I am one of them. Sometimes bad things happen to us that we just can't understand. We have no control over them, but we can control our own reactions to them. I know this has been such a difficult year for you. I'm glad to hear that you can see the light at the end now at least. Hang in there and keep going in a positive direction. I'm glad you are finally able to get some sleep too. Launna, fico feliz em ler que você teve um grande avanço durante esses meses. Algumas vezes essas pendências emocionais demoram pra se resolver, mas se resolvem! O que eu faço para ajudar nesses momentos é ocupar a mente com coisas que eu gosto de fazer. Quando vejo, as coisas ruins já ficaram lá longe, no lugar que deveriam estar desde o começo! Lu querida a vida é assim cheia de alto e baixo mais não é por causa disso que você tem quer fica triste 24 horas por dia, mais o contrario você se agarre com DEUS que ele vai ti ajudar e você não precisa pagar nada, o seu foco deve ser DEUS e pensamento positivo 24 horas por dia que tudo ja deu certo. Im glad that you are healing and talking about your emotions and feelings in such a stream of consciousness. Im still getting over things as well but thats life. We deal with it by making ourselves better. I am glad you always believe there was light when you couldn't see it. 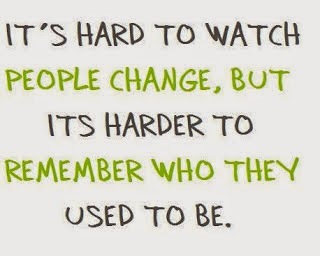 So hard when people change. I hope one day you look back and can just remember the good. so happy to read about your progress and to know you feel better now sweety! Wish you a wonderful rest of the week! This is a powerful peace Launna. For all you went through it gives others so much hope that they'll be able to come through whatever is burdening them. I'm glad you are getting good sleep again! Sending you a big well deserved hug. It will be interesting to see how you look back on all of this in another year. It will probably take more than two years, until you really see the light at the end of the tunnel! What keeps you alive is the knowladge that ther is the light, and that you already passed such a long way. I think without you girl you wouldn´t have been that strong. I mean for the first six months you just worked like a machine. You aren´t able to recognize the lack of sleep until you reach a certain point! On that point it hits you like a crash because your body rans out of energy! I hope my first commented went trough Launna, and if not, I will be right back and write you a new one, Thank you so much for everything Launna, may the Angles protect you and Valentina. with love, Tanya. Dealing with that must be brutal Launna. I have no point of reference, and I wouldn't try to give you advice, but know there are a lot of people pulling for you. I'm happy you have moved on and its getting better now. you've made awesome improvements in just one year, keep it up! Hi again Launna, as my promised to come back to write you a new comment:). From being sick I lost my concentrates and weakness as well. I'm so sorry to hear that Valentina was sick but I'm happy that she's back to health already. I also really sorry to hear that thing had happened to you in the past week. I can't imagine how you dealing with it all these emotions is like roller coaster ups and downs. The reality would have never beautiful as we want it to be Always somebody got to dealing with something - I'm saying to reminds you, you're not alone and not the only one Launna. you knew it. 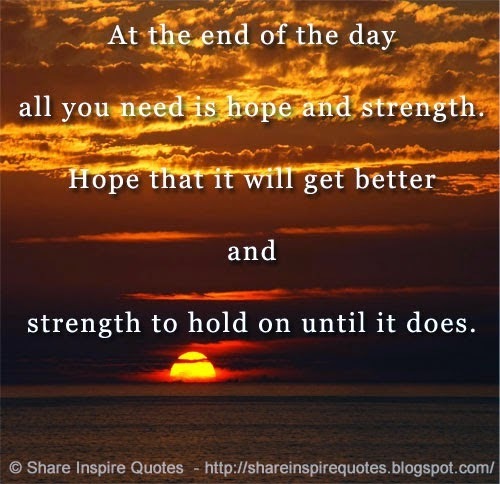 Hang in there as you always do, be a strongest person as you have ever been at least for yourself and Valentina. I'm with you all the way Launna. Whenever I'm meditating - I'm thinking of you to do the same. It helps me a lot to calm myself down when I hit the roof. All the best to you and Valentina both:). Have a better days and the rest of the week from the bottom of my heart goes to you. You have been through much and have made it, dear Launna, and are continuing to move forward, and this is good! I am glad you are sleeping better now, too, this really helps. Awww Launna..it breaks my heart to see that you broke down the other day..and why why why aren't you sleeping, Launna? I know there are so many things from the past that haunt us even till today, but Launna, why should we let the pas affect our present and hence future? And I am glad that you have still not given up hope!! This is exactly why I look up to you...you're a strong woman..Please continue to stay strong, my dear!! Happy friday, My dear Launna! Ciao, buona giornata, ti saluto e ti abbraccio. wish you a wonderful weekend sweety! It is very inspiring to read that you haven't given up hope, that is all is needed sometimes. I glad that you live and call life as it is, no need pretending all is well in your camp when it is not, not many can stand out like that. You are a role model. I'm so happy you feel better. am so happy for you to hear all the progress and the growth you have undergone. I'm so proud of you, Launna! Nine months is a long time, and I'm so sorry you had to go through that. I myself can't imagine it.. I'm a firm believer that things happen for a reason, even if we don't understand what that reason is at the time. I think that is what faith is all about----you have to have faith that these things happened for the best. Once you come to this conclusion, that's when you find hope. Hi Launna! Inmsonia is terrible. I have been suffering from it since I was a child. Sometimes you can't believe that you still go on with your daily routine. But you do. Hope you are feeling better. Have a lovely weekend! A big hug from Italy! Hi Launna, It is really true that things happen for a reason as cliched as it might sound. But then again sometimes we only learn things in retrospect. Like when some time has passed and you look back and realised lesson that you were supposed to learn or build up a wealth of knowledge on it or gained lots of experience and new emotional strength. I'm not exactly sure what had happened since I'm new to your blog but I read the previous post too. Glad to hear that you're sleeping well again. Sleep is important. It helps recharge yourself and give yourself clearer vision the next day. Hello Launna, Thank you for dropping by and sharing with me your thoughts. You're such a sincere person and it is no surprise that your followers/ readers/ blog friends/ blog friends turn friends are just as lovely. That's how meaningful connections and relationships are built. I love seeing newcomers around and I appreciate your thoughtful comment and follow. It's also nice to hear how you stumbled across my blog coz sometimes I'm always very curious about this point so thank you for letting me know. I just found Imogen recently and just like you, she seems like such a lovely person. I would check out your blog soon! PS: I just followed you on GFC. Hope we continue to keep in touch! Thank you very much for your comment. 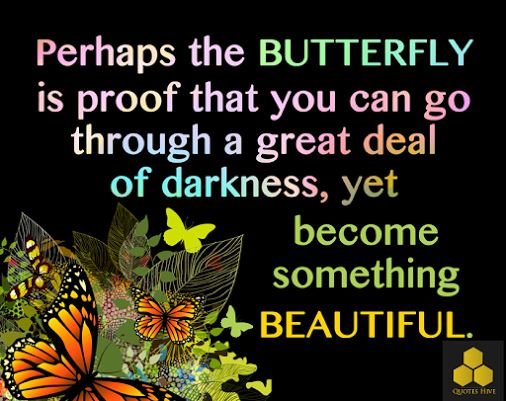 I love the sentence: Perhaps the butterfly is the great proof that you can go through a great deal of darkness, yet become something beautiful. Hugs! Ciao è sempre bello entrare nel tuo blog pieno di cose interessanti!!! hi launna... you are strong n always inspired me, for nine months is long time for me n u do it well. 2 thump up for u launna for ur spirit and never give up in hope. always love u.
Ciao Launna, have a great start of the New week!!! This is such an inspirational post, Launna. Hope you have an amazing brand new week! Hi darling! wow what a powerful story. I'm not sure what happened to you on that day but it sounds like it was def something that affected your life. I'm sorry you had to go through it but I'm so happy for your for moving on and keep going. Your words are very motivating! keep going girl! 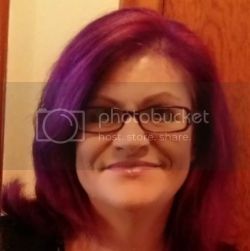 I invite you to visit my blog and if you like it let me know if you like it and would like to follow each other to stay in touch. Hello Launna. I hope Valentina is not sick anymore! I'm getting annoyed for being ill for such a longer of time. My boys are home again today, I can't send them to school with their running nose and sour throat and one of my boy has no voice at all. Isn't that terrible for them?, and a mom we are to see our kid dealing with their sickness. I was passed out myself after gave the boys the medicines and took it for myself too. You take care of yourself too my lovely Launna, I'm so glad that you didn't get it from Valentina:). You're right about it seemed this type of cold hanging so long with people. I wish you are a better week than I do Launna. I'm hanging in there. Its beautiful Launna how you always have something as magical to say as this one. We all take from you these lessons. Sometimes..I can just think so much! About the world and all that is happening around us. Gosh..its a down right Walking Dead episode..but worse..they aren't even Zombies! Then, I look around and see how no one else is all that worried about the happenings in the world. They are going on. I should too. But late it night..it will keep me up..and I have to say a prayer or two and be happy I can get up the next morning and begin again. Try to make the most of it. Thank you so much for all your notes and reading everything that I keep creating. Oh..and in the story..don't be mad at Halie..that was all Gage's doing what he told his father. And yes I am quite iffy as to what to do with Garvin...who might not really be on the up and up.. I truly hope all is coming into play in your goals from personal ones to the career ones in your very real world. Sincerely! & all the best! Lu querida tenha uma semana abençoada. Sweetie, look how far you made it. The hardest part is over. You can go through the rest with strength, until you reach your goals! maravilhoso com muitas paz e felicidade. This post really touched my heart. It was incredibly heartfelt, raw, open and honest with beautiful quotes to boot. Thank you for sharing such a beautiful and inspiring story. yeah, I had a few of those moments where everything I knew and I believed were torn apart not too long ago. it's hard to rebuild when we are that damaged. and it's amazing to look back and see how we survived those times! Life is so crazy Launna and I truly believe that we only have control over how we handle the things that happen to us in our lives. We can never go back or change anything we did in the past unfortunately. You are doing great dear and never allow yourself to go back into the thoughts of your past and the feelings. Let them go and continue to do your thing. You are on the right path! I wish you are well :))) And send you a big hug from Italy! Ciao Launna, my sweet friend!!!! very inspiring and beautiful! thanks for sharing! Atta girl. Things are better now than they were a year ago. Trust in yourself that things will be even better yet in another year. Sono passata per salutarti, carissima Launna, e quando si entra nel tuo blog si leggono sempre cose di grande interesse. Stuff happens, sometimes because of poor choices people make, sometimes because the Lord knows what will make us stronger. Thank goodness he never leaves us through the difficult parts, eh? I love your warm and touching words, Launna!! Letting go of things that have caused us pain is a difficult task, but once we do it's so liberating! Learning to deal with it is a process and you are well on your way. Keep reaching towards the light, and let go of the darkness that has held you back. You deserve it!